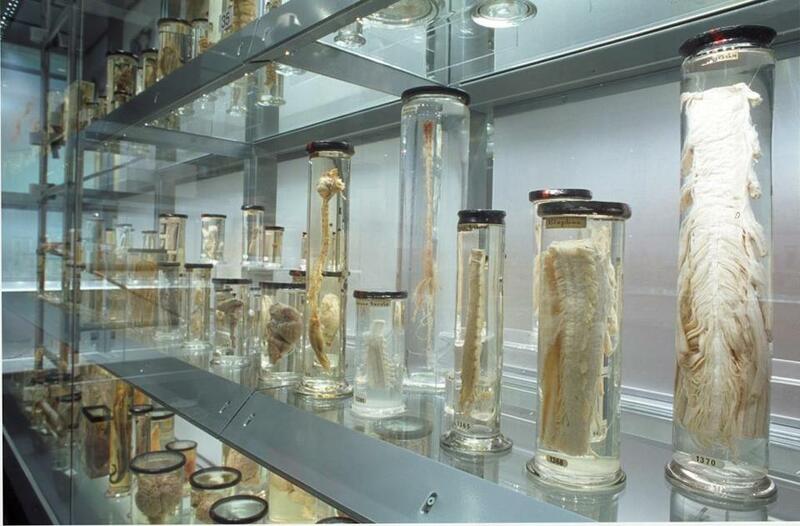 Preserved specimens displayed in London’s Hunterian Museum of the Royal College of Surgeons. LONDON — Skeletons hang from walls alongside jars of disembodied hands and heads robbed from churchyard graves by body snatchers or supplied by willing executioners. There are amputation saws, bloodletting bowls, a preserved extinct giant sloth, the fossil molar of a mastodon, and the jaws of an extinct 52-foot shark called the megalodon. No cardboard cutouts, these, with teenagers dripping in fake blood leaping from the dark to scare the guests. This stuff is real, an eccentric small collection. So you like Halloween? You can have it year-round at scary destinations like this one. Also in London, for example, is the equally little-known Wellcome Collection, left by US pharmaceutical magnate Henry Wellcome, who in his extensive travels acquired everything from medieval torture chairs to 19th-century glass eyes, tattoos (skin still attached), a guillotine blade, and a lock of King George III’s hair, from which recent analysis concluded high levels of arsenic may have caused his famous madness. 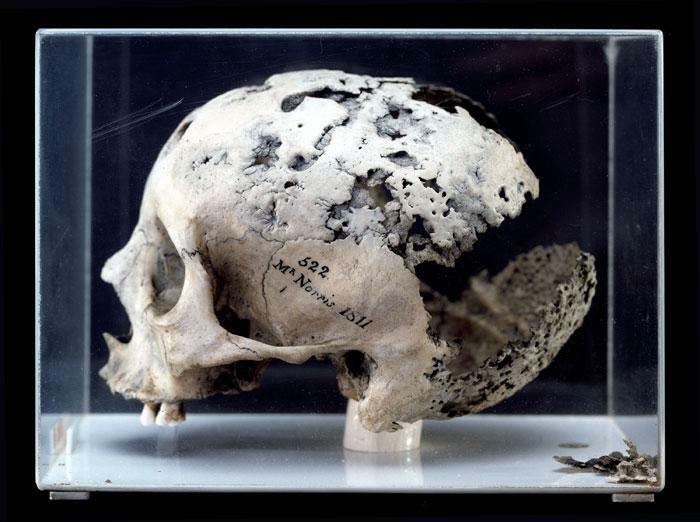 Skull in the Hunterian Museum. Philadelphia, in fact, is something of a capital of creepiness. You can tour death row in the old black granite Eastern State Penitentiary there, for instance, where Al Capone and the bank robber “Slick” Willie Sutton were imprisoned, or buzz by the Insectarium, the only US museum devoted entirely to insects, including thousands of live cockroaches teeming through a re-created kitchen. The National Museum of Funeral History in Houston displays such things as elaborate caskets and tombs, programs from the funerals of the famous, and African “fantasy coffins” shaped like fish and birds, plus exhibits about the very Halloween-y topic of embalming. Few places anywhere are as scary as New Orleans, whose above-ground cemeteries are referred to as “Cities of the Dead” — most famously St. Louis Cemetery No. 1, home to the tomb of voodoo priestess Marie Laveau. At the New Orleans Historic Voodoo Museum in the French Quarter, where displays of voodoo icons are lighted by flickering blue candles, visitors can make offerings of rum or money to the voodoo spirits. And the Lalaurie Mansion, popularized by the television show “American Horror Story,” is believed haunted by the souls of the slaves against whom its socialite owner committed atrocities so unspeakable that she was banished from the city. “Other places do Halloween and dress up for that one day or week, but in New Orleans it’s an ongoing thing,” said Robert Florence, author of “New Orleans Cemeteries: Life in Cities of the Dead” (Batture Press, 2005) and president of Historic New Orleans Tours. Cemetery tours around the country are a big draw year round. You don’t even have to go out of your way to experience this in the city. Stay at the Bourbon Orleans Hotel, for instance, a onetime convent purportedly haunted by the ghosts of children and nuns who died in a yellow fever epidemic, or the Hotel Provincial, which served as a Confederate Hospital, where guests report seeing blood stains appear and then disappear from the carpets. At Arnaud’s Restaurant, the ghost of founder Arnaud Cazenave supposedly rearranges silverware and napkins. In another old and eerie Southern city, Charleston, S.C., said tour guide John LaVerne, interest in the supernatural and paranormal has been fueled by cable TV shows about ghost-hunting and the unexplained. “That made people realize there’s a whole other world out there,” said LaVerne, who runs Bulldog Tours, which includes local jail, dungeon, and ghost tours. It’s not only Charleston where there’s been a boom in haunted tours as travelers seek their Halloween fix on the other 364 days of the year. 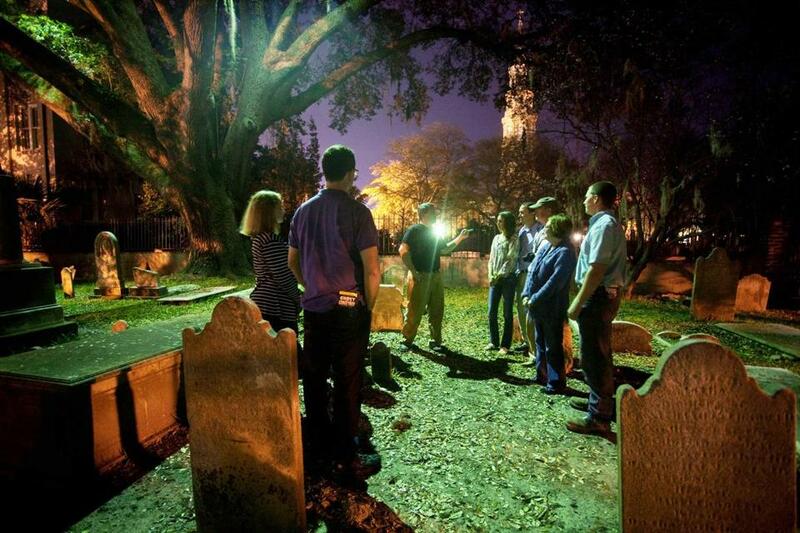 The Houston Ghost Tour includes Hermann Park, which was built atop a Civil War cemetery. Ghost Tours of Philadelphia features places haunted by, among others, some of the nation’s Founding Fathers, as does the Spirits of ’76 Ghost Tour. The costumed guides of the Ghosts, Graves & Cave Tour in St. Paul take visitors to the Wabasha Street Caves, left over from onetime mines and used during Prohibition as speakeasies by mobsters who also left behind a legacy of violence and murder. So does St. Paul’s monthly Lost Souls Tour. Haunted Pittsburgh runs tours from May through November of the underside of that town’s age of robber barons and steel millionaires. Chicago Hauntings takes in the sites of gang killings, serial murders, natural disasters, and abandoned graveyards. Haunted Manhattan concentrates on the underworld of Greenwich Village, and the dead poets who apparently bewitch its bars. In a similar twist, Charlotte, N.C., has a Haunted Bike Pub Crawl. Jon Marcus can be reached at jon@mysecretboston.com.